Dr. Seema Rathee graduated from Dalhousie Medical School in Nova Scotia and completed her internship at the University of Toronto. She was awarded a fellowship by the College of Family Physicians in 2008 for her dedication to continuing education. 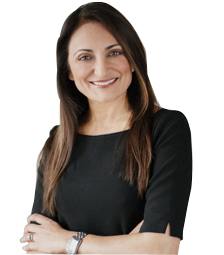 Although trained as a family physician, Dr. Rathee has worked in the field of dermatology in tandem with a successful family practice for 15 years. She also enjoyed a brief stint as a weekly medical columnist on CBC National Radio. Most recently she has been awarded a Diploma in Practical Dermatology with distinction from Cardiff University in Wales. Also, has been asked to work as a tutor for the coming year. Dr. Rathee joined the Centre for Dermatology in the fall of 2004. As her passion for medical and cosmetic dermatology grew, she decided to leave family practice in 2006 to focus her entire energy toward skin and skin diseases. Dr. Rathee is trained in both Botox and Hyaluronic Acid Fillers and strives to create a youthful but natural look for her patients using these non-invasive techniques. She is also involved in many of the clinical trials taking place at this centre. Her compassionate and caring nature, along with her dedication to continuing education gives her patients both comfort in her approach and confidence in her expertise.